DEAR TIM: My son was visiting me and decided to do a good deed. With the help of my wife, he painted our front door. The color is a magnificent bright red but the finish has many brush strokes. Up close, the door looks horrible. What's the best way to refinish the door? Can I simply sand the high spots or must I strip the paint from the door? My son and wife used a disposable brush. DEAR RENARD: Ugh! I've seen my fair share of painted surfaces that look good except for the defect you describe. Other defects such as unfilled holes, un-sanded peeling-paint edges, un-caulked cracks, etc. can also ruin an otherwise great paint job. Professional painters and those that sell paint sundry items constantly preach the mantra of using the best tools when painting, as well as doing all necessary preparation before paint is applied. CLICK HERE to get FREE & FAST BIDS from local painters who'll redo your front door. Your wife and son had the best of intentions, but possibly underestimated the required steps to achieve professional results. The actual technique of applying the paint may not have been a problem. It's entirely possible the previous coat of paint had the ugly brush marks and this new coat of paint could not hide them. If your son used a high-gloss paint, this could be part of the problem. Let's assume the previous coat of paint was flat or an eggshell sheen and had brush strokes. Flat or eggshell paints tend to do a great job of disguising surface imperfections, even some brush marks. Gloss paint is the exact opposite. They amplify the smallest surface imperfections. Gloss paints reflect much of the light rays that strike the surface of the painted object. The light rays bounce off at different angles when they strike imperfections, like a combed brush stroke. This is why the brush marks stand out. You can see the tiny shadow lines from the light rays bouncing off at different angles. You can see this in glossy car finishes when a car door or hood has the slightest ding or dent in it. Certain paints have more body to them and some can hide subtle surface defects by bridging over them. Even if such a paint was used, I'd never depend upon it to cure an obvious surface defect. If the previous painter created the problem, the surface should have been sanded to remove the brush marks before the next coat of paint is applied. At this point the best thing to do is to wait until the new paint hardens, or cures, enough so it can be sanded. This curing process can take anywhere from ten to thirty days. In certain situations it may take longer. Some paints may not cure for up t0 sixty days. The hotter it is the faster paint cures. If you try to sand uncured paint, it will rapidly clog the sandpaper. Attempting to sand a paint finish less than five days old can lead to disastrous results as the film can actually tear apart. If you're so impatient that you can't wait, then chemical stripping is the path you must take. Personally, I'd only strip the door as a last resort. Paint stripping can be a messy task to say the very least. I'd start sanding using a hand-held power sander that has an orbital sanding pattern. These power sanders do an excellent job of removing surface defects when equipped with the right paper. Try using 120-grit aluminum-oxide sandpaper for the first sanding. Aluminum oxide is the light-brown sandpaper you see at paint stores or home centers. It's self-sharpening and affordable. Here's an assorted pack of aluminum oxide sandpaper that will do a great job on soft wood. CLICK THE IMAGE TO ORDER IT NOW. You'll know the paint is hard enough to sand if the sander begins to produce dust from the paint film. If you don't see any dust and the paper has started to clog with paint, STOP. Wait five to seven days and try to sand again. Once you're able to successfully sand, the surface of the door should be very smooth to the touch after you run the sander over it several times. Before you begin to sand the offensive brush strokes, run your hand across them. You should be able to feel the uneven surface unless you have very thick calluses on your fingertips. 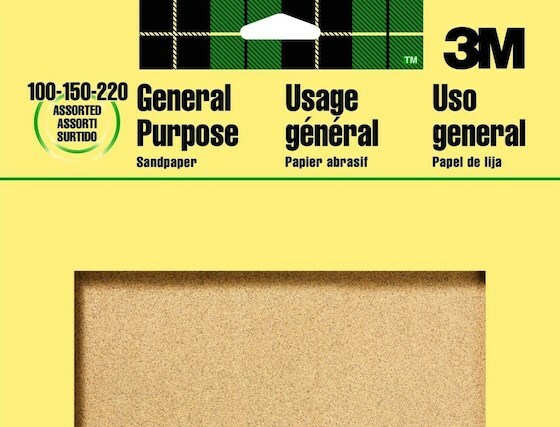 After sanding with 120 grit paper, you should be able to feel a much smoother surface. Don't hesitate to change the sandpaper on a frequent basis. Fresh paper cuts faster. Once the door surface is smooth and dust-free, it is time to repaint. If you desire as smooth a finish as possible, I would absolutely remove the door from its hinges and paint the door while it is laying flat on two sawhorses or portable work stands. This allows gravity to help flatten the paint after you apply it. Painting the door flat eliminates the possibility of runs. The pros use a paint additive to get silky smooth finishes. This is one of their best-kept trade secrets. I've had stunning results using Floetrol. It comes for both latex and oil paint. 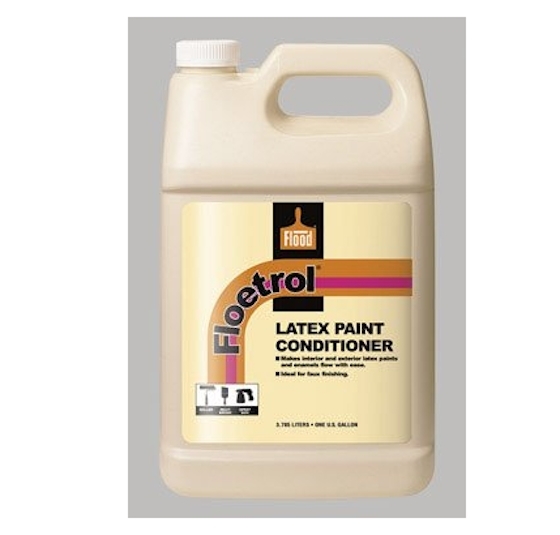 CLICK HERE to get Floetrol for latex paint. This is a fantastic time-tested paint additive. It tames paint and makes it lay FLAT. CLICK THE IMAGE TO ORDER IT NOW. The paint conditioners reduce the surface tension of the paint allowing the paint to spread out evenly under the force of gravity. 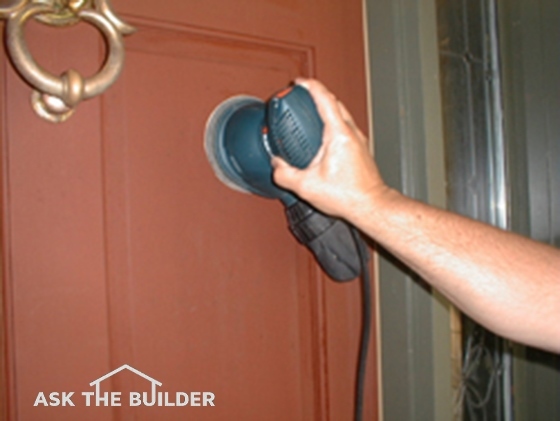 When you combine a paint conditioner with laying the door flat, you'll get superior results. Be sure to use the most expensive brush you can buy and match it to the type of finish paint you choose to use. China bristle is often preferred for oil paint and a polyester brush is usually the weapon of choice for latex based paints. A professional-grade brush will yield incredible results. Here's a great Purdy polyester brush for latex paint. If you care for it, it will last for years. I have some Purdy brushes that are 20 years old. CLICK THE IMAGE TO ORDER NOW. Once the paint is dry, you can put it back on the hinges making sure to remove any weatherstripping from the door jamb. If the uncured paint touches the weatherstripping, it can peel away from the door the next time you open it. Leave the weatherstripping off the door jamb for about ten days. My home was built in 1892, and I have all original oak woodwork. One section of a door frame is "dimpled" in the varnish. Suggestions as to how to fix this? Easy. Sand away the dimples. Be sure the finish is as smooth as glass. Apply the clear finish I show below. CLICK THE FOLLOWING LINK and order it now.